The communities denounce the government's 'neoliberal program' and want to know of possible changes in the demarcation of indigenous lands. SÃO PAULO, BRAZIL – For the second straight day members of Brazilian indigenous communities protest in Brasilia against government indigenous programs. On Wednesday morning several indigenous leaders tried to occupy buildings in the Brazilian Congressional complex, but were stopped by legislative police. Indigenous march on Presidential Palace in Brasilia, photo by Marcelo Camargo/Agência Brasil. 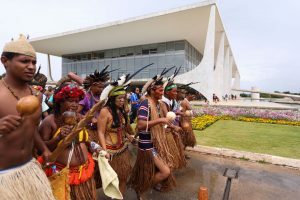 On Tuesday the members of indigenous communities demonstrated outside the Presidential Palace and met with, among other officials, Health Minister Ricardo Barros, Justice Minister Alexandre de Moraes, and President Temer’s Chief of Staff Eliseu Padilha. “We the indigenous peoples, traditional fishing communities, quilombola communities, and babassu coconut breakers, are in a national mobilization denouncing the governments neoliberal program, which has the support and endorsement of the legislative and judicial power and we stand against any and all setbacks in our rights, conquered with much struggle and bloodshed,” said the statement handed to government officials by indigenous leaders. The protesters demand more resources for their communities from the National Institute for Colonization and Agrarian Reform (Incra), the National Foundation for the Indian (Funai) and the Union Heritage Office (SPU). Traditional communities also want to know about the recent rumors of possible changes that the government plans to make in the administrative procedures for demarcation of indigenous lands. When President Temer took over as interim in May of 2016, he said that he planned to review all demarcations made by then-President Dilma Rousseff from December 2015 (when the impeachment process started) to May 12th, when Rousseff was suspended from her post. According to officials more than 75 decrees were issued by the former leader during that time, giving more than 1.4 million hectares of land to indigenous communities.